First you need an expert and courteous customer service team to take all details about the delivery on the phone or email. Sometimes, all you need is an efficient online booking system to do it yourself, but in either case, you need some serious administration equipment to assess where the drivers are and which one will be faster to the pick up point. This is particularly important if you are desperately trying to get an envelope for A to B and you need your courier service to be urgent or direct. Right, so we need to talk about bikes and vans now. In fact, not about the vehicles, but the most important part… the drivers. A courier driver needs to make quick decisions on the quickest routes to make a delivery, sometimes aided by the office crew. A courier driver must also be able to quickly find some difficult pick up points and most importantly, reassure the client that their envelope or parcel will be carefully looked after during the delivery and that it will get to the right destination on time. 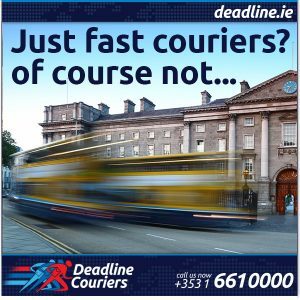 Deadline Couriers ticks all the boxes above, providing not only one of the best quality and competitively priced courier services in Dublin but also an outstanding next day delivery service nationwide in Ireland and Northern Ireland.